Dear Mr. President: Congratulations on a hard-fought race for your second term as President. With your recent victory, I hope you will use your power — as a legislator, but also a bully pulpit — to broaden your agenda and take on some of our society’s most pressing issues. And, you have one thing that no other President has ever had — an army of two generations of social entrepreneurs who are fighting every day to change the landscape of education, health care, and workforce development. The United States was founded on the free enterprise system and now social changemakers are using these principles to solve problems. As Bill Drayton suggests, “Social entrepreneurs are not content just to give a fish or teach how to fish. They will not rest until they have revolutionized the fishing industry.” The good news is that the social entrepreneurship movement is politically agnostic. Democrats connect with the cause because we are finding solutions to help the neediest among us, and Republicans appreciate that we are focused on social and financial return-on-investment. In your first term, we made some progress with social entrepreneurship. You started the first Office of Social Innovation and one state, Illinois, has followed your lead. You also created the Social Innovation Fund to find innovative programs and help them become scale-ready, which also led to agency-specific initiatives in the Departments of Education and Health and Human Services. However, as social entrepreneurs, we need you to go one step further as our champion-in-chief and help us harness the collective power of the government and individual citizens to create and sustain the changes needed to “revolutionize the industry.” We are beyond the pilot phase and are ready to take the movement to scale. First, we need to celebrate that we have made significant gains on many social issues. Look at our recent track record with the drunk driving and tobacco movements. 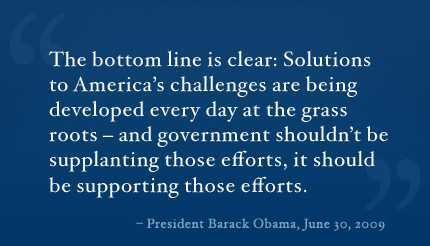 We know that if we put our collective energy behind an issue, we can solve it. We have learned from these movements that behavior change is difficult, so awareness and education alone do not solve problems. There are no silver bullets or short-term solutions. We have to use multiple approaches over an extended period of time and leverage innovative methods, such social marketing and behavioral economics, to effectively tackle problems and achieve meaningful impact. Second, we need to scale what works. Let us not make “perfect the enemy of the good.” We need to find the best-available ideas, curriculums, methodologies, and programs in each sector and take them mainstream. Recently, the Social Impact Exchange launched the S&I 100 Index for this very reason. These are pre-approved, evidence-based initiatives that are ready to scale to any community across the country. Third, we need to encourage young people to serve their country as social entrepreneurs (inclusive of intrapreneurship) within the sector – whether as teachers, social workers, healthcare workers, or nonprofit professionals. In 2005, a Bridgespan study estimated that 640,000 new nonprofit leaders will be needed by 2016 due to the growth of the sector and retiring baby boomers. Young people have already found social entrepreneurship – over 350 schools and universities across the globe are focused on it, according to researcher and professor Debbi D. Brock. We need to attract smart people to the sector and ensure that being a social entrepreneur is as valued as being an entrepreneur. Fourth, we need to break down the silos among change agents in academia, government, philanthropy, nonprofits, and business and across sectors (e.g. human services, health, education). We need to support translating research to practice and ensure that best practices are fast-tracked to frontline staff. We are all working toward the same end. Those in need do not understand the silos we create. They just need help. Finally, we need to learn from our for-profit counterparts and create a supportive ecosystem to amplify the growth of social entrepreneurship in communities across the United States. We need to build the capacity of current and future social sector leaders to think creatively about social issues and encourage them to take risks on behalf of those they serve. We need to support nonprofit and for-profit social entrepreneurs who want to launch new ideas – through training, technical assistance, and access to capital. We need to support online marketplaces, similar to Fair Trade, so consumers can easily and confidently buy from social enterprises with the profits going back to the mission. How do we activate this movement? In the 18th century, we had an Age of Enlightenment where science and reason helped societies, including our own, exchange ideas and advance on a number of fronts. Today, in the 21st century, we have an opportunity to rise to the challenges facing us globally and, using the concepts behind social entrepreneurship, create our own Age of New Enlightenment. Social entrepreneurs cannot do it alone and we need your help to take us to scale and to make social change-making mainstream. A version of this article originally appeared on SEE Change Magazine. Suzanne Smith, MBA is a serial social entrepreneur and bridges many disciplines, including serving on the National Board of the Social Enterprise Alliance, coaching nonprofits as Managing Director of Social Impact Architects and Co-Founder of Flywheel: Social Enterprise Hub, and educating future leaders as Adjunct Professor at the University of North Texas. She holds an MBA from Duke University, where she was a CASE (Center for the Advancement of Social Entrepreneurship) Scholar and continues to serve as a Research Fellow.